What does hearing this story bring up for you? What images, feelings, words, songs, other stories come to mind? This is an interesting story, because we see a couple of things happening that are very unusual. First, we see someone with a disease that forces him to be an outcast coming into the midst of people. A leper (which would be anyone with a skin disease–could be as mild as acne or as serious as Hansen’s disease, which we often call leprosy) is not allowed to come into contact with people because he is ritually unclean and would make others so. The only way to be admitted back into society is to be declared clean by a priest. For someone in a position of authority (say, a rabbi) to speak to, let alone touch, someone like this is unthinkable. And yet the leper comes, and Jesus makes a choice. If you choose, you can make me clean. Not “will you help me?” Not “can you heal my disease?” Not “can you save me/make me whole/restore me to community?” Not a question, a statement–if you choose. Some scholars think that this implies that the man was already well but that the priests had refused to declare him clean–whether for monetary reasons or some kind of personal or social gain. However, the words here–“make me clean”–are more than just the declaration. There’s something actually happening here, and this man knows that Jesus has the power to change it, if he chooses. Then we have the second interesting and unusual thing. Our translation says that Jesus was “moved with pity.” Others say he was “filled with compassion.” Still others say that Jesus was “moved to anger.” Passion is definitely implied in the word here–this is not a tame emotion, or simple pathos. This is a full-bodied, all-in, visceral involvement in the life of another being. Jesus may be angry at the way things are, at the system that has brought this man to this point. He may be angry at the rules so carefully followed even to the detriment of human beings. He may be passionate about restoring people to wholeness, body mind and soul as well as community. He may be filled with the kind of compassion that does not allow us to be silent or motionless. Whatever it is, it’s a consuming fire moving him. He’s not separate from us, he’s close by, down to earth, right here, involved in everyday actions and feeling and lives, to his very core. As a consequence of this passion becoming visible, the man foregoes another trip to the unhelpful priests, and instead goes about the towns and countryside proclaiming the greatness of his benefactor…and so many people hear about it (the man must be literally shouting Jesus’ praises from the rooftops!) that Jesus can’t even get into town anymore because of the crowds. Instead the people have to come to him. What do you think about that, after the discussion we just had about Jesus’ visceral and whole-self involvement in the life of people? How does this background help you understand the story? What questions do you still have? What ideas does this bring up? How does this story affect your relationship with God? What do you notice in this text? How does the story strike you? What feelings, images, sounds, other stories, or music pop into your head? Can you get a sense of Jesus’ movement, mood, plans, vibe? What is he up to? Why do you think Jesus and the disciples went to Peter’s house? Some suggest it was because he had one of the bigger houses in town. Others think perhaps location, location, location. Maybe Peter had mentioned his mother in law already? We haven’t heard about his wife, of course….nor will we! Where is she in all this? 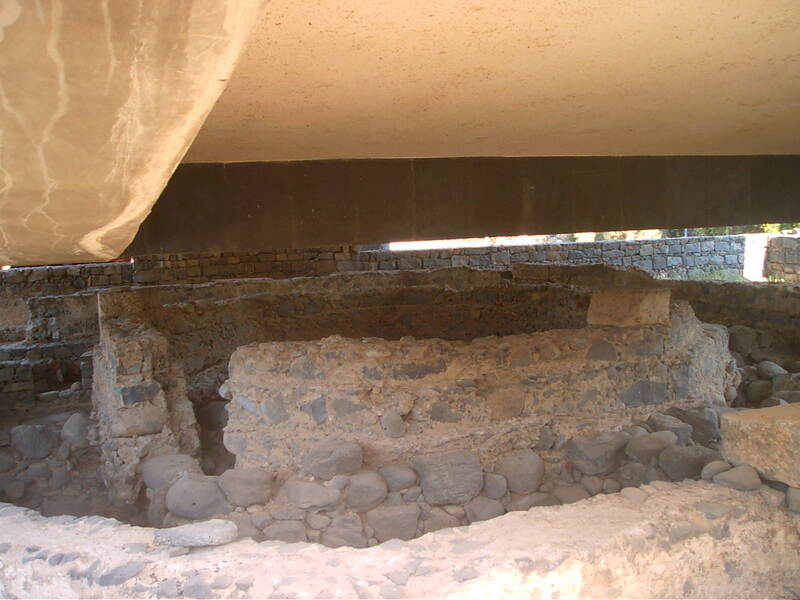 Jesus is going to use Peter’s house in Capernaum as a sort of home-base for the next stage of his ministry–lots of things are about to happen here. How would you react if you were living in that town? Peter’s house quickly became known as a holy site, and was eventually converted into a church. it was enlarged and changed several times, but in the picture of the site below you can get a little bit of a sense of what kind of place we’re talking about. Having seen it, can you better imagine this story? Why do you think Jesus goes off by himself to pray? He obviously heard something from God during that conversation–which tells us he was listening at least as much as he was talking–because he came down all ready to leave town and head out on the mission. When you pray, do you listen as much as you talk? What would help you learn to pray in a way that would nurture a real relationship (not just an asking-but-not-getting-answers one) with God? What do you think is the good news for RCLPC in this story? What is the challenge for RCLPC? How do you hear God calling, and how will you respond? What do you hear in this story? What questions do you have? What do you wonder about? Can you imagine this scene? Imagine someone with amazing authority–the kind that comes from within, where the person just radiates authenticity and knowledge and grace and truth. Imagine that person preaching in our church…and then a disruption. What are you thinking when this disruption happens? What do you feel? What are your immediate reactions to this man, his appearance, his outburst? What do you think of what he says? When Jesus heals the man, he changes him–not from the outside in, but from the inside out. Jesus calls out transformation. The man was likely still just as unsavory looking, just as frustrating to behold or to be around, just as dirty (maybe even more so, since he’s just been thrown to the floor! ), but nonetheless he is changed. Jesus is interested here in the man’s inner self, not in his outer appearance. Have you ever been caught up in someone’s (or your own!) outer appearance, while neglecting the inner self? What kind of transformation is most attractive to you–inner or outer transformation? Makeovers, plastic surgery, diets and exercise fads are a multi-billion dollar industry in our culture. But inner transformation is usually left out of the picture. What do you think about that? How do you participate in that culture? How do we pass it on to our youth and children? Is it what we want to pass on? Jesus teaches with authority, and transforms people in ways we can’t even imagine. Do you have any experience of Jesus transforming your life? What is that like? How can you help others to find that kind of transformative good news? Read the story again. What music do you hear as the soundtrack to this part of the film? What other stories or characters or moments or novels or movies come to mind? What good news do you hear for our community, or for you individually? Last week we talked about some of the difficulty of hearing God’s call. This week, it’s pretty obvious–when Jesus walks by on the beach and calls you out of your fishing boat it’s hard not to notice! in Jesus’ day, there was a sequential education system for Jewish boys. Young boys would go to learn the Torah (they’d memorize all of it–the first five books of the Bible!). When they’re about 10 or so, they’d interview with a rabbi who would either take them on as a student in the next level or tell them to go apprentice with their father instead. Of those who stayed on with their education, they’d memorize more (the historical books, probably the prophets too). At around 13, they’d apply and interview with a rabbi, and if the rabbi thought the kid was good enough, smart enough, and had enough potential, he would say “come, follow me.” If not, the kid would go learn the family business. A rabbi would only call you to follow him if he thought you had what it takes to learn to be like him. To follow, to be a disciple, means to do what your rabbi does, means to devote your life to following him with your body, your mind, your heart and soul. The vast majority of kids didn’t make it to that level–they went home to learn from their dads and to eventually become carpenters or potters or fishermen. You would think these guys, who hadn’t made the cut, who didn’t get asked by another rabbi, would probably have thought “what? is he talking to me?? ?” and would look around, confused and wondering who else was out there that Jesus could be talking to. When they realize it’s them, they leave everything and follow him. Jesus has just told them that he believes they have the potential to do what he does, to be like him, to learn and follow and be committed. If someone believed in you that much, would you leave your dad in the boat and follow? Why does Jesus need disciples anyway? Why does he call people to come and learn and to be like him, to do what he does? Well, every good minister needs a team, right? God created us to be in community, and Jesus was no different. He needed a community to help him discern, to bounce ideas off of, to learn and grow with, to teach, to be friends. We can’t do much without the help of our friends. So here we have Jesus building his team–calling people, ordinary people, people who hadn’t made the cut by the world’s standards–and telling them that he believes in them, that they can be like him. Have you ever heard this call? Have you ever wondered what God might want you to do? Have you ever wondered what it would be like to follow Jesus, to try to be like him? Remember: God equips the called…and the called are often the most unlikely of people. Thinking about this story, and the background you know, and your experience with Jesus’ call, what else comes to mind for you? Are you reminded of any other stories (biblical or fictional, movies or novels or even children’s books)? Is any music running through your head? What do you think is the good news in this text? What is the challenge? How might we express this good news and this challenge in our time and place?